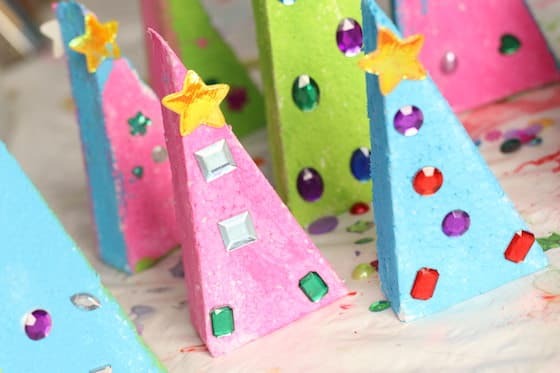 Kids can make these easy STYROFOAM CHRISTMAS TREE TABLE TOPPERS to display on your Christmas dinner table, or on a mantel or on a window sill this holiday season. This fun and easy Christmas craft is great for kids of all ages, and will add a pop of colour to your home over the holidays. Christmas is my favourite season for crafting with the daycare hooligans. 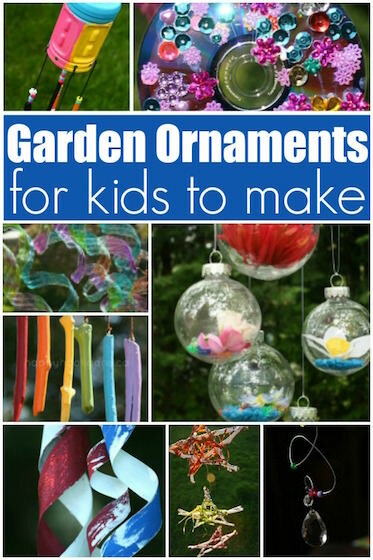 There are just so many beautiful crafts for kids to make at Christmas time. 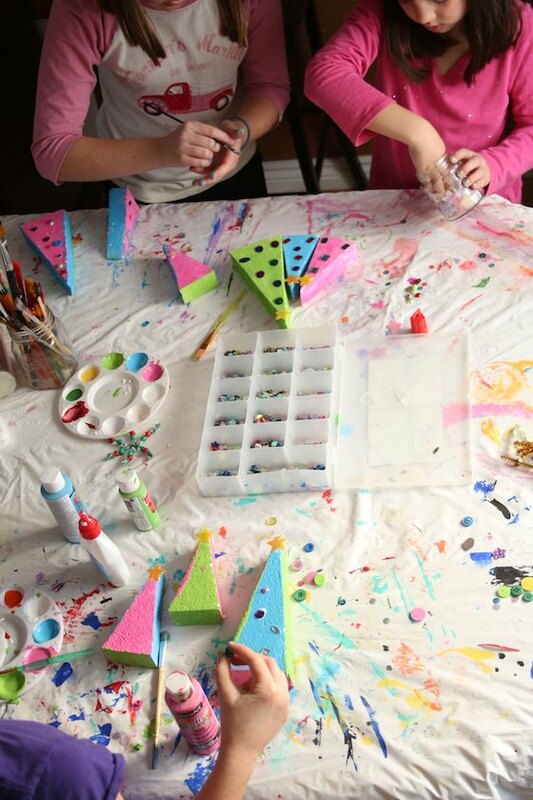 Last week, we made these charming styrofoam Christmas trees with a handful of basic craft supplies. 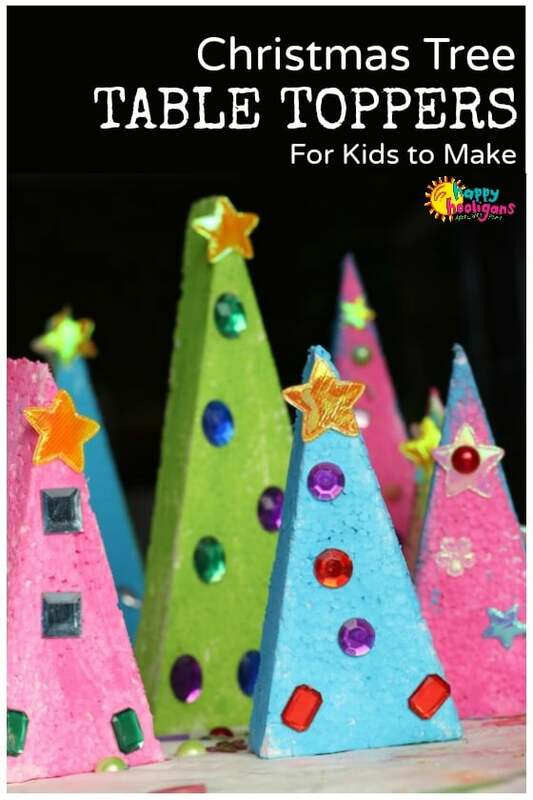 The kids plan to use their colourful trees as table toppers but you could create a Christmas scene with them on a mantel or a window sill, or you could attach a loop and hang them on your Christmas tree like we did with our styrofoam button trees a few years ago. However you use these pretty trees, they’ll add a fun pop of colour to your home this Christmas, and the kids will be thrilled to see their creations on display. Of course, you can paint your styrofoam trees in traditional Christmas colours like red, green and gold but we love how modern and chic our brightly coloured trees look. Choose whatever colours match your decor, or let the kids choose. No matter what, your styrofoam trees will look lovely topping your Christmas table this year. You can add even more charm to your Christmas table with these simple kid-made holiday napkin rings! 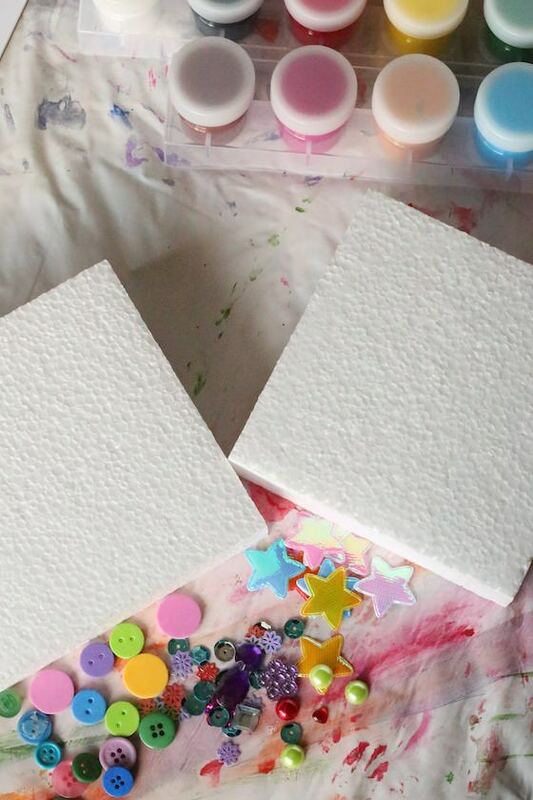 craft gems and jewels or buttons, craft foam, sequins etc. 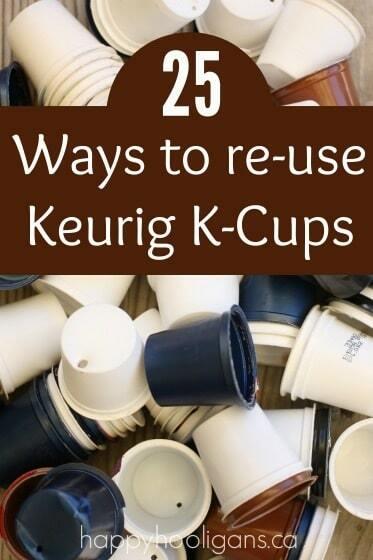 These trees are a great way to repurpose styrofoam that certain purchases are packaged in. 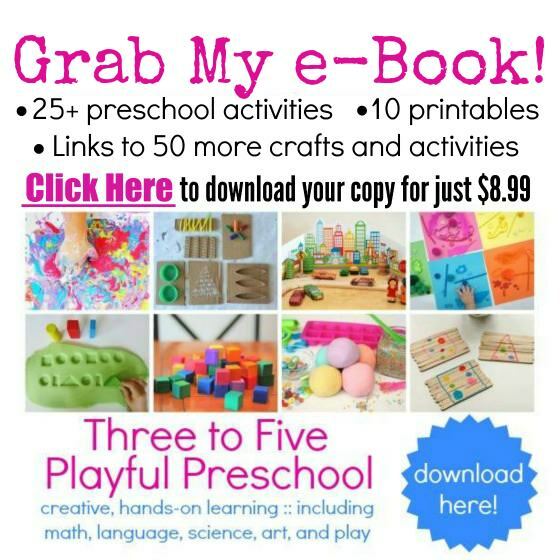 You know me – I’m a bit of a hoarder when it comes to keeping materials like this for crafting with my daycare kids. 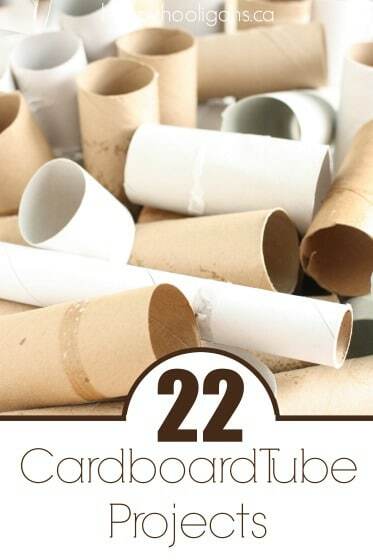 Repurposing our recyclables (not that styrofoam is recyclable, but you know what I mean) keeps our crafting costs down and there’s an extra element of creativity when you turn an item not intended for crafting into something awesome. We started with a few squares of styrofoam. With a pencil and ruler, I drew triangles on them, and then sliced along the lines with a carving knife. 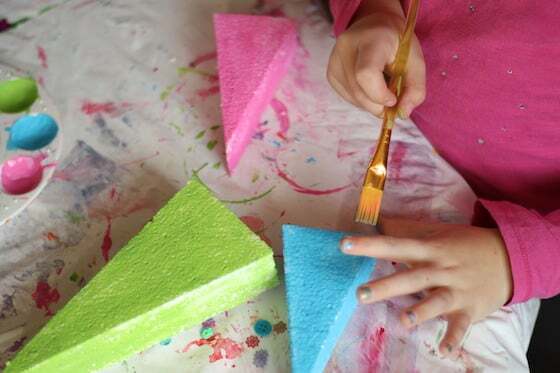 When you cut the styrofoam with a knife, the edges may be a bit shredded and rough. 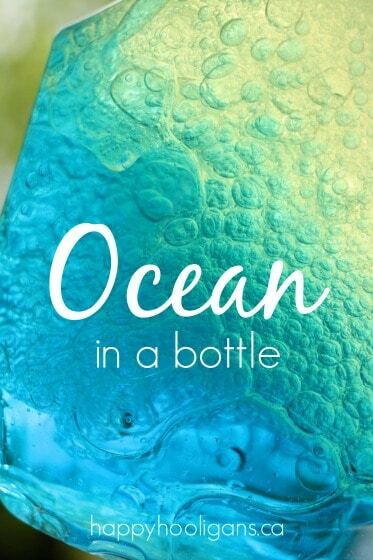 Smooth them with a piece of fine sandpaper to clean them up. We gave our trees one coat of paint but feel free to give yours a couple of coats if you don’t want any styrofoam peeking through. Some of the hooligans chose to use one colour of paint per tree, but others chose to mix things up, and used several colours per tree, painting the back, front and sides in different colours. 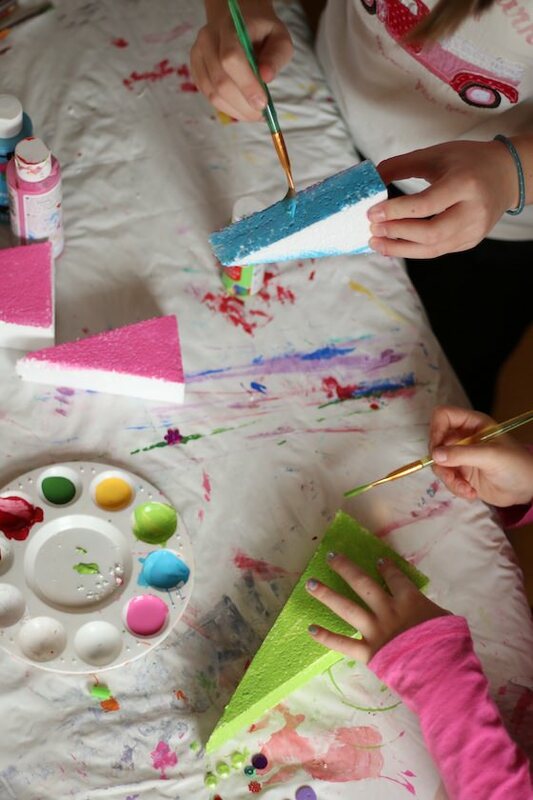 To dry our paint quickly, we gave our styrofoam trees a blast with the hairdryer. Hold on to your trees! Those things can really blow around. Ha! When our paint was dry, the kids selected all kinds of sparkly gems and jewels to decorate their trees with. Our container of craft jewels is one of our most treasured items in our craft cupboard. We get them out almost every time we craft. 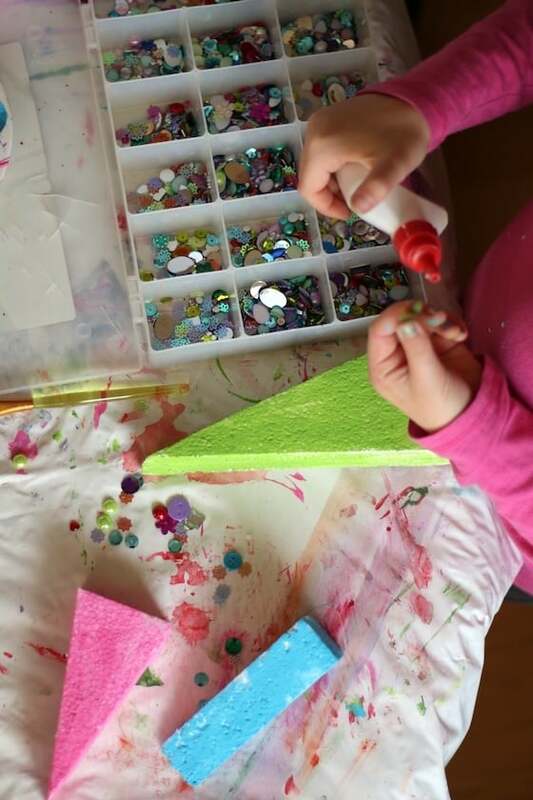 If you don’t have a stash of gems and jewels like this in your craft room, I would highly suggest you hit the dollar store and stock up on a few packages. 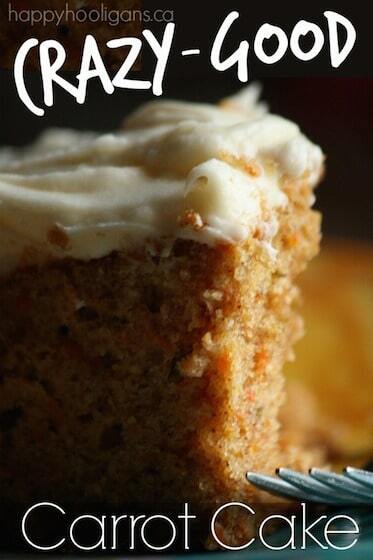 They’re inexpensive, totally versatile, and the kids just love them. Hey, a little bling makes everything more exciting, right? The kids glued their colourful jewels to the fronts and backs of their Christmas trees and they topped each one with a puffy star. 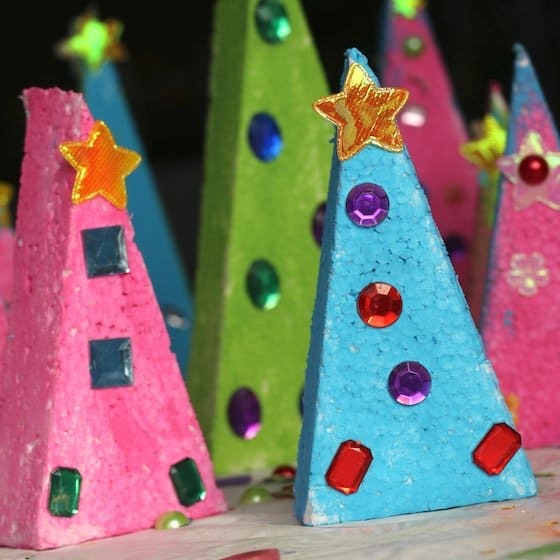 Styrofoam Christmas Tree Table Toppers. Don’t you love when something so simple turns out so great?